Continuing a series of interviews with Irish children’s authors, Olivia Hope from the Down the Rabbit Hole blog at Writing.ie talks to Corkman, Cethan Leahy about his first year as a published author. Tuesdays Are Just As Bad is published by Mercier Press. How long did it take from beginning your first draft of ‘Tuesdays Are Just as Bad’ to it appearing on the bookshelves? I started it during Lent 2015 as a challenge to myself (I don’t eat chocolate so I have to find something to do). I set myself 500 words a day and by the end, I had a slim first draft. It was published in June 2018 so just over 3 years! It was a great experience. The process can be long and eventhough it sounds nightmarish, I loved having my work looked at in minute detail. My editor and I were on the same page throughout and the book is much better for it. My main challenge was sticking to the rules for the ghost I made. Me waving my hands at plotholes saying “It’s a ghost thing?” didn’t wash, I’m afraid. I’m not sure if the writing has changed, but it is nice to have actual proof you once finished and published a book as reassurance when you are midway through your 2nd manuscript, openly weeping over a thousand words you suddenly have to delete. I’ve been lucky as most of my reviews have been generally positive. A boy haunted by his own ghost is a weird concept but I am happy to see people are able to get on the same wavelength. In fact, some of the insights are so good, I’ve been stealing them for occasions when people ask me about the book. Death of the author and all that. Visit your local bookshops – they are always happy for you sign their stock or discuss events. They want your book to sell as much as you do. Also make friends with your library! Enjoy it and also be patient! Nothing happens quickly in publishing so savour it. 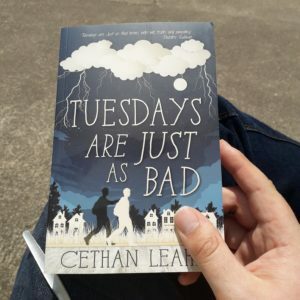 Thanks so very much Cethan, we very much look forward to reading more of your books in the future. 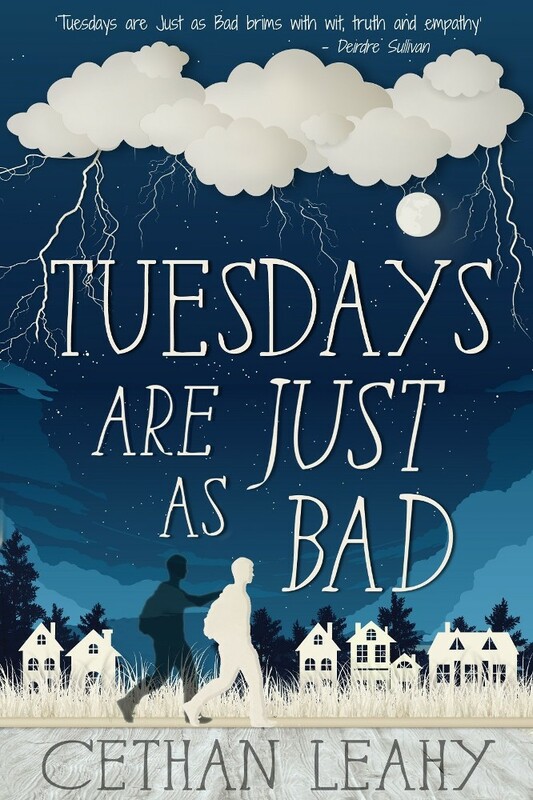 Tuesdays Are Just as Bad is published by Mercier Press. When troubled teenager Adam wakes in hospital after a suicide attempt, he finds that he has company. A ghost. Or perhaps it’s something else. This ‘ghost’ is as confused as Adam about the whole situation. Narrated from the point of view of this ‘ghost’, Tuesdays are just as Bad follows Adam as he attempts to return to normal life – whatever that is. When Adam makes new friends via his counselling sessions, he ends up developing a relationship with one of the gang, Aoife. Surrounded by these friends, Adam starts to feel happy again. The ‘ghost’, however, becomes jealous. In the end, he decides that the only way he can be free of this feeling is to isolate Adam so he can have him all to himself, with catastrophic results. A mix of Louise O’Neill’s Asking for It and Nothing Tastes as Good by Claire Hennessy.